Exquisite display of Tennis was seen at the French Open today. Players like Dominic Thiem and Serena Williams put up a great show of Tennis on the clay court. Also, Caroline Wozniacki performance against Pauline Parmentier stunned the crowd today. This is the 2nd Half of the French Open Match Highlights of Day 6. In case, you missed the 1st Half click here. Result: Marco Cecchinato defeated Pablo Carreno Busta at the French Open by 2-6, 7-6(5), 6-3, 6-1. Although, Marco Cecchinato lost the first set by 2-6 to Pablo Carreno of Spain but he recovered in the upcoming sets. The second set was interesting as both the players were scoring points and eventually the set came to a tie. Marco won the tie, hence, winning the second set. Now Marco needed to win only 2 sets in a row so that he could made it to the next round. It was a surprising moment for the crowd as Marco won the next two sets by showing his exquisite performance and booked his name in the round of 16. The match of Marco Cecchinato at Roland Garros in the round of 16 is yet to be decided. Result: Dominic Thiem defeated Matteo Berrettini at the French Open 2018 by 6-3, 6-7(5), 6-3, 6-2. Dominic Thiem, the Austrian star player, faced Matteo Berrettini of Italy in the round of 32. The match was worth-watching between the two professionals as both were giving their best in the match. Dominic won the first set and was determined to win the upcoming sets but, his expectations failed when the second set came to a tie. Both players tried to outnumber each other but the Italian, Matteo, won the set which was a sign of relief to him. The sets were tied and the match moved on further. Dominic Thiem won the next two sets by a lead of 6-3 and 6-2 which showed that he was back in the game. 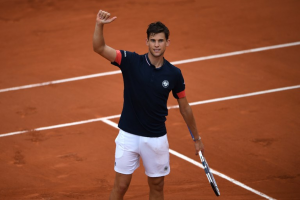 Dominic Thiem of Austria made it to the round of 16 where he will be facing the Japanese Tennis player, Kei Nishikori, in the French Open 2018. Result: Mihaela Buzarnescu defeated Elina Svitolina by 6-3, 7-5 . An exquisite performance was seen on the clay court today of the Romanian, Mihaela Buzarnescu, who defeated Elina Svitolina in the French Open bby 6-3, 7-5. It was a thrilling match as the two women were struggling to made it to the next round. Elina was a tough competitor but the Romanian put up a good fight against her and won the sets like it was a piece of cake. Mihaela claimed her top-five win of her career and proceeded to the next round of the French Open. The Romanian star is now set to face the American Madison Keys in the round of 16 at Roland Garros. Result: Caroline Wozniacki defeated Pauline Parmentier by 6-0, 6-3 . What a fabulous and an absolute performance it was by the Danish Tennis player, Caroline Wozniacki, who silenced the crowd by defeating the local player Pauline Parmentier. The first set started and Pauline was stunned by her opponent’s performance as she was just leading her with a fast pace. Caroline won the first set by 6-0 and the crowd was on their feet by her dazzling and outstanding performance. However, Pauline tried to beat her in the next set but Caroline again won it by 6-3 and made her place in the next round. Caroline Wozniacki will now face the 14th seed Daria Kasatkina of Russia in the round of 16 of the French Open 2018. Result: Serena and Venus defeated Kirsten and Sara by 6-4, 6-2 . Serena paired up with her sister Venus Williams to compete against Kirsten and Sara. The American sisters defeated the Belgian, Kirsten, and the Italian Tennis player Sara Errani, the first two sets as they make their way to the next round. Serena Williams was back in form as she struggled against Ashleigh Barty in the Women’s single match in the round of 64. Some of the matches were stopped abruptly due to rain like of Karen Khachanov and Lucas Pouille, in which Karen was leading by 6-3, 7-5 , 1-1 against home favourite Lucas in the third round on Court Philippe Chatrier. These were the highlights of the second half of the Men’s and Women’s Tennis. Join allsportspk, if you haven’t, so that you can see the French Open 2018 day 7.